معروفی نیا, ادریس, اثنی عشری, عادل, حسن زاده, یوسف, خوش طینت, سعید, احمدی, حسن. (1395). شبیه‌سازی عددی سه بعدی الگوی جریان در حوضچه ترسیب اولیه با استفاده از مدل عددی SSIIM2. مجله آب و فاضلاب, 27(6), 15-23. 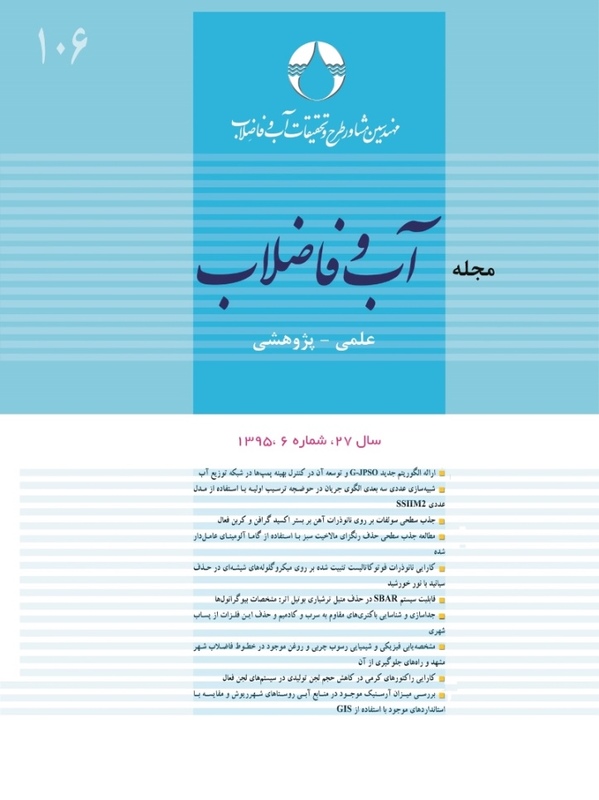 ادریس معروفی نیا; عادل اثنی عشری; یوسف حسن زاده; سعید خوش طینت; حسن احمدی. "شبیه‌سازی عددی سه بعدی الگوی جریان در حوضچه ترسیب اولیه با استفاده از مدل عددی SSIIM2". مجله آب و فاضلاب, 27, 6, 1395, 15-23. معروفی نیا, ادریس, اثنی عشری, عادل, حسن زاده, یوسف, خوش طینت, سعید, احمدی, حسن. (1395). 'شبیه‌سازی عددی سه بعدی الگوی جریان در حوضچه ترسیب اولیه با استفاده از مدل عددی SSIIM2', مجله آب و فاضلاب, 27(6), pp. 15-23. معروفی نیا, ادریس, اثنی عشری, عادل, حسن زاده, یوسف, خوش طینت, سعید, احمدی, حسن. شبیه‌سازی عددی سه بعدی الگوی جریان در حوضچه ترسیب اولیه با استفاده از مدل عددی SSIIM2. مجله آب و فاضلاب, 1395; 27(6): 15-23. حوضچه‌های پیش ته‌نشینی از اجزاء مهم و اصلی در فرایند تصفیه آب به شیوه متعارف به‌شمار می‌روند. به دلیل هزینه بسیار زیاد ساخت این حوضچه‌ها که در حدود 30 درصد کل هزینه تصفیه‌خانه‌های آب را به خود اختصاص می‌دهد، مدل‌سازی و عملکرد بهینه حوضچه‌های ترسیب بسیار حائز اهمیت است. در حوضچه‌های ته‌نشینی و رسوب‌گذار به دلیل وجود گرادیان‌های سرعت متفاوت، نواحی مختلفی از جریان از جمله جریانات چرخشی به‌وجود می‌آید. این پدیده باعث ایجاد اتصال کوتاه، افزایش نواحی مرده و تغییرات در میزان اختلاط می‌شود که ممانعت از ایجاد بستری آرام جهت رسوب‌گذاری نموده و بازده حوضچه را نیز کاهش می‌دهند. لذا همواره سعی می‌شود فضاهای مرده کاهش داده شود. اولین گام برای بهینه‌سازی حوضچه‌های پیش ته‌نشینی، محاسبه صحیح میدان سرعت و حجم نواحی چرخشی است. در این مقاله با به‌کارگیری نرم افزار SSIIM ، حوضچه ساده و بافل دار کالسروحه با مدل آشفتگی ε k- استاندارد مدل‌سازی شده و نتایج آن با نتایج آزمایشگاهی مقایسه شد. Settling basins are considered as a major and important component in conventional water treatment processes. The high cost of constructing these basins accounts for approximately 30% of the total capital investment of water treatment plants. Hence, it is essential to model and optimize their performance beforehand. In settling and sedimentation basins, different areas of flow including secondary and rotational flows occur due to the velocity gradient. Such phenomena cause short paths, increase flow stationary and dead zones, and change the mixing rates of the flow, which collectively prevent laminar conditions to be created for the sedimentation process, and thereby reduce process efficiency. The remedy is to reduce as far as possible the dead zones in the flow. The first step to optimize a settling basin is to calculate accurately the velocity field and the volume of rotation zones. The present study presents the numerical simulation of a flow in a rectangular basin. Continuity and Navier-Stokes equations are solved using finite volume method. A 3D flow simulation is performed using the standard k-ε turbulence model for settling basins with and without baffles. Finally, the numerical results obtained are compared with experimental results reported elsewhere. 1. Stamou, A.I., Adams, E.W., and Rodi, W. (1988). “Numerical modeling of flow and settling in primary rectangular Clririers.” J. of Hydraulic Research, 27, 665-682. 2. Liu, B.C., Ma, J., Luo, L., Bai, Y.,Wang, S., and Zhang, J. (2010). “Two-dimensional LDV measurement, modeling, and optimal design of rectangular primary settling tanks.” Journal of Environmental Engineering, 136 (5), 501-507. 3. Shamloo, H., and Bayat, A. (2006). “Investigation of the turbulence different models in hydraulic analysis of the initial sedimentation basins using Fluent software.” 4th National Congress on Civil Engineering, University of Tehran, Tehran, Iran. 1-7. (In Persian). 4. Celik, I., Rodi, W., and Stamou, A. (1985). “Prediction of hydrodynamic characteristics of rectangular settling tanks.” Proc. of the Int. Symp. Refined Flow Modelling and Turbulence Measurements, Iowa City, Iowa, 641-651. 5. Saneie, M., Azhdarimoghadam, M., and Hajiahmadi, A. (2014). “Experimental investigation of the effect of curvature submerge vane with 60 degree radial section on the efficiency of vortex settling basin.” Watershed Engineering and Management, 6(1), 83-94. (In Persian). 6. Lyn, D.A., and Rodi, W.(1990). “Turbulence measurement in model settling Tank.” J.of Hydraulic Engineering, 116,(1), 3-21. 7. Armenio, V., and LaRocca, M. (1996). “On the analysis of sloshing of water in rectangular containers: Numerical study and experimental validation.” Ocean Engineering, 23(8), 705-739. 9. Tamayol, A., Firoozabadi, B., and Ahmadi, G. (2007). Effects of inlet position and baffle configuration on hydraulic performance of primary settling, tanks.” Journal of Hydraulic Engineering, 134(7), 1004-1009. 10. Zhou, J., McCorquodale, A., and Godo, A.M. (1994). “Short circuting and density interface in primary clarifiers.” Journal of Hydoulic Eng., 120(9), 1060-1080. 11. Ghoreishi Najafabadi, S. H. (2014). “Development of three-dimensional numerical model to simulate fluid flow and sediment transport in the settling Basins.” Numerical Methods in Engineering, 2, 37-48 (In Persian). 12. Shamloo, H., and Comar, S. (1998). “The effects of flow turbulence in settling basins.” Asian conference Water and Waste Management, Tehran, Iran. 31-23, (In Persian). 13. Emadi1, A.R., and Kakouei, S. (2014). “Determination of optimal dimensions of settling basin using ACS algorithm considering hydraulic, sediment and structural attributes.” J. of Water and Soil Conservation, 21(2), 261-275. (In Persian). 14. Dobbins, W.E. (1944). “Effects of turbulence on sedimentation.” Transactions of ASCE, 109(2218), 629-656. 15. Olsen, N.B.R. (2013). “A three-dimensional numerical model for simulation of sediment movements in water intakes with moltiblock option.” Department of Hydraulic and Environmental Engineering, the Norwegian University of Science and Technology. 16. Tamayol, A., Firoozabadi, B., and Ashjari, M. A. (2010). “Hydrodynamics of secondary settling tanks and increasing their performance using baffles.” Journal of Environmental Engineering, 136(1), 32-39.